Happiness Our Spirit Essence but not something ready-made. The Dalia Lama is spot on with his quote, that happiness is not something readymade. Happiness is like a desire – we all have desires and may experience disappointment if we don’t get these desire met. This reminds me of the Buddhist philosophy, “the greater the desires – the greater the suffering”? In our Western rationalistic world, we’ve unfortunately trained ourselves to attain happiness through things – those materialistic things!! It is described from a Buddhist perspective as “fleeting happiness.” Wow, that coffee was great equal’s a happy moment. Seeking the happy things or the feel-good zone can, unfortunately, become or lead to an addictive behavior. Is genuine happiness alluding us in the digital age? How much of our happiness is created by ‘screen time’? Fundamentally, it is about balance to get our happiness through such desires. We are not going to stop shopping to feel happy, but the key to this is our insight and awareness around what need this is fulfilling within ourselves. How Do We Action and Create Happiness? For me, I believe that our happiness comes from a depth within ourselves that I describe as our Spirit Essence. I believe that the energy of our happiness comes from connecting more with our Spirit Essence. The vibration from our space of ‘spiritual essence’ is beyond belief. I am not sure that we can truly live in it 24/7. We need to ‘show up’ in the world to live and get stuff done (buggar LOL :). By bringing this happiness into our everyday life – Wow, what a way to “show up.” It makes our day flow so much better. It is like a double positive. The more happiness we bring, the better day and the better the day, the more happiness there is!! I jokingly say in sessions, ‘I’d love to levitate above Tibet 24/7 in this state.’ The more I/we practice and action it I believe we can carry the spirit essence of happiness into our daily lives. In creating happiness, the external environment can have significant influence. The environs and the people surrounding us can create a beautiful space of happiness and joy. Remember the experience(s) of being around negative people and how drained you can feel (OMG)!! By being around positive like-minded people we immerse ourselves in this positive vibration. This is a mutual space that can heighten our happiness. It’s like we all wire into and raises the vibrational energy that is around us. This is the mutual space for creating healthy positive relationships. How do we make this happiness last at a personal level? 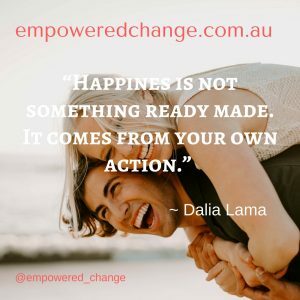 Being Happy – What actions can I take? The actions to create our happiness needs to happen at all realms of our psyche: physical, mental, emotional and spiritual. There has to be a focus on our physical habits, for a healthy body can lead to a healthy mind. At the mental level, there is the process of mindset changes. In the emotional level, there is the “letting go.” Focused action at these realms allows a quietening of our mind noise (monkey mind) and an easing of our heart pain (wounds). Such processes open our Heart to more flow of our Spiritual Essence. From the physical level we need to be mindful of our bodies and what we eat, the amount of sleep and exercise we do. Are we eating suitable food that nourishes the body with the high amount of vitamins and minerals, (e.g, rainbow color salads, fruits, and vegetables)? Our bodies, gut health, and brain need enough fuel to work efficiently which has a flow-on effect on our emotional well-being. Exercise is becoming more so important in our sedentary lifestyles. The amount of sitting we do is incredible with the associated screen time both at work and at home. Incorporating a lifestyle with exercise is great to release toxins from the body, increase endorphin which can, in turn, heighten our happiness. The sense of achievements, reaching our exercise goals, provides a powerful lift for self-esteem. Last but not least, is the sleep factor. How much each person’s body needs varies from between 6 to 9 hours. Getting the right amount of sleep is imperative for the body and brain’s recovery. If we don’t get the right amount our stress levels can increase triggering increased irritability and we then find it hard to focus on usual jobs at hand. What is your sleep time ritual? Are you mindfully zoning down or chilling out before bed? Are you turning off ‘white light’ devices such as smartphones and televisions 30mins before bed? To action being happy we may have to look at changing our mindset. Our brains will continue to fire the way the neurons have been wired. If happiness has not historically been in the wiring, it will take considered action to rewire it. It is really weird how that works and how it defaults to the ‘familiar’ (Default Mode Network DMN) despite the fact at some level we dislike it. Many of the people I work with are overstressed, and happiness is fleeting. Learning to shift this familiar mindset, I introduce a concept of ‘Soul Mindfulness of Being’. I link this space with a cellular memory of a moment of ‘awe’ which we all have experienced. Such as a sunset or a full moon. Such experiences might be similar to the ‘Universal Oneness’ described by many Eastern Philosophies. It’s a powerful memory and everyone’s ‘energy’ just lights up. There is a sense of power and joy when they remember it. What do you experience when you reflect on this photo? These experiences touch the innate happiness deep within us. This suggests that if the cellular memory is there – could it be our old mindset that is blocking access to this inner happiness? I wonder sometimes whether we have wired our brains to be familiar with stress. This is where we need to act and refocus on our mindset of happiness. Positive activities, self-care, and practices like meditation can subtly bring about a mindset change. 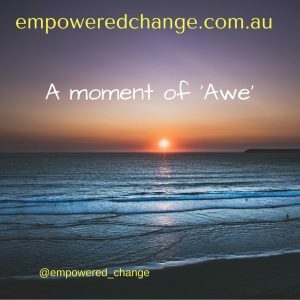 For every time the brain wires to the negative – stop, check in, and think and remind ourselves to, “re-wire to the opposite, the positive.” If it doesn’t work, allow the mind to reflect on the powerful moments of ‘awe’ in our lives. Use this moment to allow ourselves to be immersed in this powerful memory space. With focus and deliberate practice it, it will slowly change, only if we want it to. It will take deliberate practice, hopefully not the full 10,000 hours!! Our Zen of our happiness is deep within the psyche. Yes, I’d love to levitate above Tibet all day!! The HOW of happiness is – How do I bring it with me to the everyday life events and chores? There is a Zen saying, “Before Enlightenment chop wood and carry water ~ After Enlightenment, chop wood and carry water.” Even after I’m enlightened, OMG I’ve still got to chop wood and carry bloody water!!! The big difference is the energy with which we chop the wood and carry the water. As spiritual beings having a human experience, we ain’t going to be happy all the time. Remember the famous Yellow Pages advertisement, “Not Happy Jan! !” You know those days! We will have our sorrows!! Or experience unexplained emotional or physical pain. Deep in the midst of these tough times, this is where we call on the practice and mindset. Here we need to reflect within, to the powerful happiness of our Soul and let it shine through. Whilst it may not have the usual power of happiness it’s there. It’s the underlying loving warmth holding us as we heal the sorrows that may need ‘healing’ in the present moment. This new embrace and new acceptances ~ is our action and deliberate practice ~ for happiness.